The Holistic Practitioners and Yoga Teachers at Cave of the Heart are dedicated to providing the best care and guidance to all of our clients, students and members. With over a combined half of a century of experience, each Practitioner and Teacher brings their education, training and wisdom to create a well-balanced atmosphere for healing to occur. Our Holistic Practitioners and Yoga Teachers may vary with respect to the form of treatment/teachings they provide, but each of them possesses the same unconditional love for their clients/students. For more information about each Holistic Practitioner and Yoga Teacher, please read each individual Biography. Bhakti Yoga (Path of Devotion) is the core at Cave of the Heart. It is through weekly Satsang and monthly Kirtan that we are able to gather together and chant for Peace, Love and Happiness. 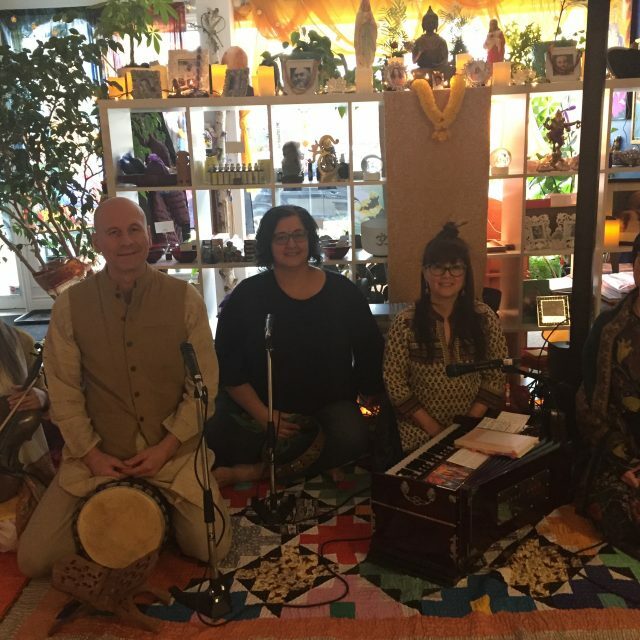 Please join The Kirtaneers Bhakti Band at monthly Kirtan and help raise the good vibrations! Led by Nancy Dayā Drew (harmonium/lead vocals), David Pare (drum), Tara Watts (guitar), Josie Burns (tambourine), Cassidy Sita Logsdon (violin) and Kerrie Prema Riberdy (kartals) these Bhakti’s help to open hearts everywhere! JAI KRISHNA! JAI HANUMAN! JAI RAM! 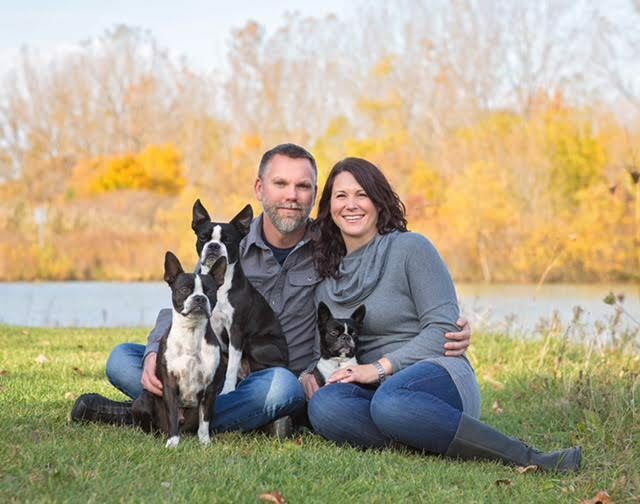 Kerrie Prema Riberdy (Owner Cave of the Heart) is a Licensed Holistic Practitioner offering over two decades of experience in Holistic Health Services. 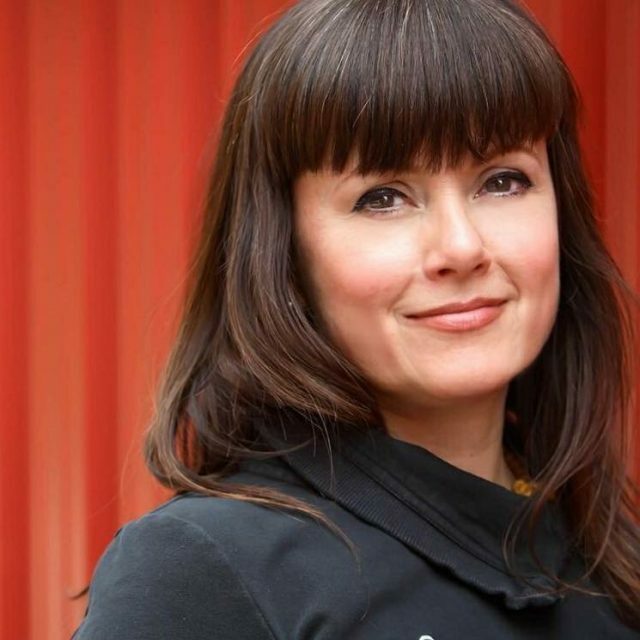 Her previous businesses include Sol Invictus (2000-2013) and Flower Power (2013-2018). Kerrie is a CFA (Canadian Federation of Aromatherapists) Health Practitioner and an RRCO (Reflexology Registration of Ontario) Reflexologist. Her other Certifications include Holistic Spa Facial, Hot Stone Massage, Indian Head Massage, Reiki, Therapeutic Touch and Tuning Fork Therapy. She is also a Certified Hatha Yoga Teacher and member of The Kirtaneers Bhakti Band. Kerrie’s Treatments and Yoga Classes are both loving and nurturing. She has been blessed with the spiritual name Prema which is Sanskrit for Love, chosen for her by Swami Shivabhaktananda of the Sivananda Yoga Lineage. She has a strong adoration for Hanuman-ji, Lord Krishna, Archangel Raphael and Mother Mary. Her devotion to Bhakti Yoga has encouraged her to study the Hanuman Chalisa, a 40 verse poem written by the Indian Saint Tulsidas. Under the guidance of her teachers David Shiva Das and Abby Durga Devi, her Bhakti Soul Sister Nancy Daya Drew and her beloved harmonium Sukhi, she has been able to open her heart and sing the names of the Divine. Cave of the Heart is a small space with a big heart! Nestled in the heart of Olde Riverside, it is a healing sanctuary for those seeking refuge from the stress of everyday life. Services and classes are created with the intention of pure love thus polishing the heart so that we can all shine our light brighter! Love is the key to the door deep inside the Cave of the Heart. Namaste’. Like a true Gemini, Suzanne has wandered many paths before opening Dōma Holistics. She has worked in the nonprofit environmental sector, taught university students and baked over a thousand vegan cakes for a local café. Her interest in natural healing therapies began in graduate school when she was researching the indigenous peoples of South America. Although ethnobotany was not in the stars for her, the healing modalities of women across the globe became a lifelong interest. When her father became terminally ill, Suzanne embarked on the holistic path in earnest to help alleviate his suffering. In 2008, she received her certificate in reflexology from Blok’s Hands of Healing. 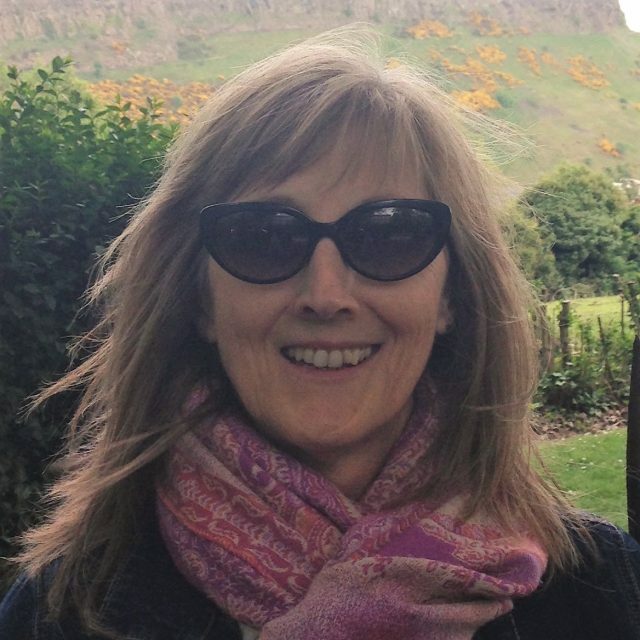 Suzanne is a registered reflexology practitioner with the RRCO. In 2013, she studied with Dr Sisira Premarathna learning Ayurvedic head and foot massage techniques. Dōma Holistics is a practice that draws on the traditional healing techniques of women healers all over the world. Domā (meaning at home in many languages and cultures) Holistics is a comforting and cosy space that is accessible to those with mobility issues and is LGBTQ inclusive. Suzanne works with people who spend long hours on their feet and those that stare at a monitor/screen for far too long. If you suffer from headaches, neck and shoulder tension, insomnia or achy tired feet, come to the Dōma and experience the relaxing effects of a massage or reflexology session. There will be a cup of tea waiting for you. 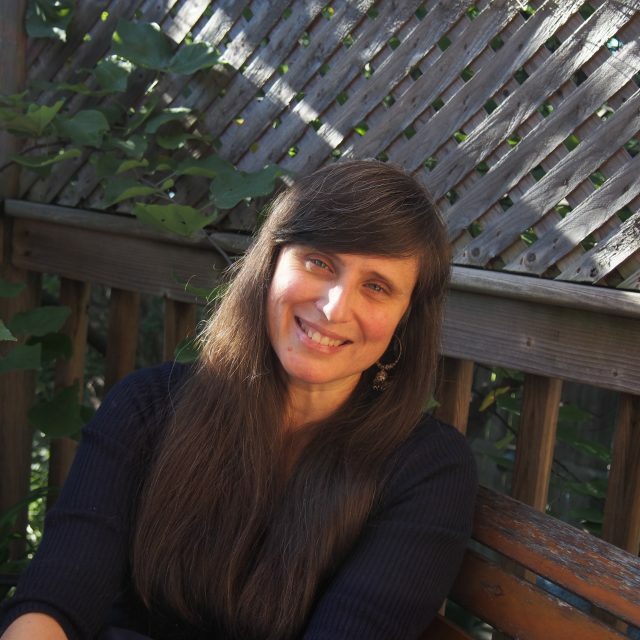 Dōma Holistics is owned and operated by Suzanne Friemann, B.A. B. Ed, M.A, RRPr. Dōma Holistics is a practice that draws on the traditional healing modalities of women healers all throughout the world. The Dōma is a warm, cosy and comforting space located in Cave of the Heart holistic centre and yoga studio in Olde Riverside. Reflexology is a non-invasive therapeutic treatment method applied to the feet using finger and thumb techniques. This method is based on the principle that the reflexes in the feet correspond neurologically to other parts, glands and organs of the body. Through the application of pressure on these reflexes, reflexology can relieve tension and stress, improve circulation and support the body’s ability to function optimally. Treatment will include a mini foot soak and a reflexology treatment. Clients will be asked to remove shoes, socks, hosiery, and roll trousers up to the knees. Treatments can be performed either on a massage table or in a zero gravity chair depending on the client’s preference and mobility. Organic oils will be used, and clients can choose between a relaxing and more vigorous treatment. This unique treatment comprises of two parts. The first is a traditional Ayurvedic foot massage in which the foot, ankles and calves are massaged with moderate pressure in both feet so that asynchronous harmony is maintained. In Ayurveda, Padabhyanga or foot massage is considered the mother of all therapies. It is a holistic therapy and part of traditional Ayurvedic treatment. Pada means foot in Sanskrit and Abhyanga means the use of medicated oils. With this treatment, you will receive a herbal foot soak and a traditional foot, ankle and calf massage. Kansa Vatki foot massage ™ was developed by the founder of The London Centre of Indian Champissage and based on the traditional Ayurvedic massage techniques. Kansa in Sanskrit means bronze and this part of the treatment involves slowly rubbing a small handcrafted bronze bowl on the plantar surface of the feet as well as calves and ankles. Focusing on the Marma sites in the feet (energy points), Kansa Vatki assists the flow of Prana (life force) in the lower limbs helping to draw out excessive heat and leaving the body cool, refreshed and relaxed. Treatments are performed on a massage table, and organic oils are used. Clients will be asked to remove shoes, socks, and hosiery and roll trousers up to the knees. Shiroabhyanga is part of the Hindu healthcare practice of Ayurveda and focuses on a massage of the head, neck and shoulders. During the treatment, oil will be kept for a suitable period on the head, and vigorous massage techniques through the scalp are used pulling the oil through the hair and following with the massage of the face, neck and shoulders- the areas most vulnerable to stress and tension. This treatment helps to de-stress the whole body and induces a state of calm and tranquillity. It may relieve aches, pains and tension in your neck, back and shoulders and increases the lustre of hair, treat dry, damaged hair and promote hair growth. During this treatment, clients will be seated in a chair, and the entire head will be anointed with warm organic oils that are suited to your dosha or energy type. A cape will be provided to protect your clothes. Please wear a loose fitting sleeveless shirt and bring a headscarf or other head covering with you so that you may look respectable on your way home or back at work. Ayurvedic head massage is kind to hair but not kind to hair-dos. To benefit fully from Shiroabhyanga, you should leave the oils on your scalp until you can wash them at home. Treatment Hours: Tuesday 11am-530pm, Friday 11am-7pm & Saturday 9am-4pm. Hello! I’m Marsha Nichols, founder and driving force behind Zen Healing. As a multifaceted healer, I’ve discovered that my calling is helping others unlock their potential and live at their highest vibration. I understand that the road to success is made of countless steps, and I’ve made plenty of stops along the way! Certified as a Reiki Master (ICRT, CRA-RP), Reflexologist (RCRT), Crystal Healer (CCH), and Yoga Teacher (RYT-200), I’m currently training to become a Bach Flower Practitioner. My personal practice began when my feet first touched the yoga mat in 2006. Through breathing, balance, and movement I was able to deepen my spiritual awareness and develop a greater sense of self. Yoga wasn’t just a part of my life; it was life-giving. By completing my first Yoga Teacher Training in 2015, I transformed my lifestyle into a livelihood, making it my mission to promote yoga’s incredible healing properties. But why limit me to just one ancient healing practice? Using yoga as a jumping off point, I have spent years immersing myself in reiki, crystal therapy, reflexology, and Bach Flower Remedies. A lifelong student in both my personal and professional lives, I approach each modality with a genuine desire to help others along their own spiritual and wellness journey. The two things I bring to every healing session are authenticity and empathy. I understand the daily struggles my clients face because I’ve encountered them– and continue to face them– myself. As your guide, I meet you where you’re at and take the time to empower you in your individual wellness goals. Despite my certifications and training, at the end of each day, I’m only here to facilitate the process. My greatest joy is the moment my clients realize they’ve been their own healer all along. Reflexology is a focused pressure technique, usually directed at the feet or hands. It is based on the premise that there are zones and reflexes on different parts of the body which corresponds to and are relative to all parts, glands and organs of the entire body. When the reflexes are stimulated, the body’s natural electrical energy works along the nervous system to clear any blockages in the corresponding zones. Crystal Healing is a holistic, non-invasive, vibrational energy-based system of healing. That is, it treats the whole person and their integrated energy system. It is therapeutic and deeply relaxing. The technique uses precisely placed crystals either on and/or around the physical body. An Amethyst BioMat is a unique device combining Far Infrared Rays (FIR), Negative Ions and Amethyst crystals to produce deep penetrating light energy and heat for a maximum sense of well being and healing experience. It helps reduce stress, inflammatory response and toxic insult while supporting alkaline balance and lymphatic movement. The BioMat can be used to achieve the benefits of a sauna, allowing more customized temperature regulation without the hazards of heating the head or the harmful EMF exposure in traditional saunas or heating devices. The Amethyst Crystals produce the highest frequency of vibrational energy that the body can absorb, thereby promoting increased conduction and absorption of Far Infrared and Negative Ions. The BioMat is an FDA, and Health Canada Approved medical device and is a safe way to increase alertness, improve memory skills, remove toxins from your body, and find inner peace. Bach Flower Remedies are tools for transformation that can assist in moving forward and creating change in one’s life. They can help to heal old wounds and to assist with new ways of being. The remedies can facilitate a strengthening of one’s ability move more easily in the world, to have healthier relationships, and to experience greater joy and ease of well-being. Nancy Daya Drew’s introduction to the benefits and healing powers of Yoga, Chant and Meditation began unfolding in 1997. After several years working as a busy hairstylist and involvement in the music industry, stress in the body and mind was beginning to take its toll. A beginner yoga class at a local community center began to reveal the benefits of Yoga and meditation and a true seeker was born. Many wonderful and inspiring teachers laid the pathway and a visit to a Sivananda Ashram (in 2003) filled in all the missing pieces. This is known as a Gurukulam lineage of yoga with deep roots, steeped in science, tradition and endless benefits to the practitioner. It is more than “exercise,” reaching all levels of human experience and self-study. It stands the test of time, and Nancy Daya joyfully teaches and shares all she’s learned in yoga classes, workshops, Satsang and Kirtan. A perfect accompaniment to Asana (physical aspect), meditation, Jnana (knowledge aspect) of Yoga and Bhakti (devotional aspect) keeps the balance. Nancy recognizes and humbly bows to her many great (Gurus) teachers, family, friends, clients and mentors on this path of yoga and life. Om Namah Sivaya! Gayle began her yoga practice in 2009 and felt an immediate connection. Wanting to delve deeply into the practice, Gayle searched for training opportunities and began by completing Yoga Nidra Teacher training at Kripalu in Massachusetts with Jennifer Reis. In 2011 she travelled to California for the 200-hour YTT one month intensive at the Sivananda Ashram and Yoga Farm. It was here that she received the spiritual name Gayatri, which represents the Femine Divine. The Gayatri Mantra is also a universal prayer, and when recited can ignite the Divine light within. Yin Yoga Teacher training with Lynne Baum followed, and another 100 hours of training with the Blossoming Lotus Yoga Shala program. Gayle Gayatri continues to take workshops and online courses related to yoga and meditation as well as tries to participate in at least one yearly silent Vipassana (insight meditation) retreat. She has studied and practiced the Dhamma from guiding teachers Winne Nazarko, Pascal Auclair, Molly Swan, Norman Feldman, Thich Nhat Hahn, and S. N. Goenka. 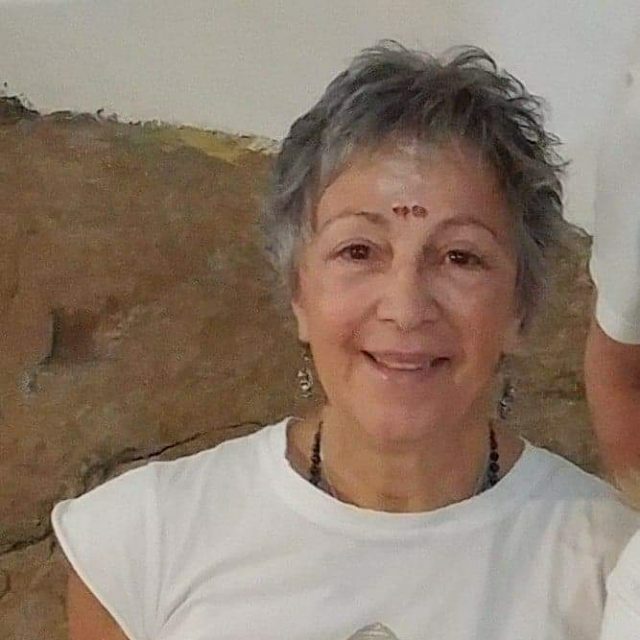 Gayle Gayatri believes firmly in the benefits of yoga and meditation in supporting the physical, mental, and spiritual well-being of everyone and feels privileged to share what she has learned. Rina’s spiritual path began to deepen following her retirement from a 35-year career with the CBSA (Canadian Border Services Agency). She found the healing benefits of Yoga several years ago after suffering from a back injury. After seeking different paths of yoga, she discovered the Sivananda teachings through her friend Nancy Dayā Drew. This led her to complete the Yoga Teacher Training in Val Morin, Quebec. It was there that she was given the spiritual name Arcanā, which translates to honour/praise/worship. 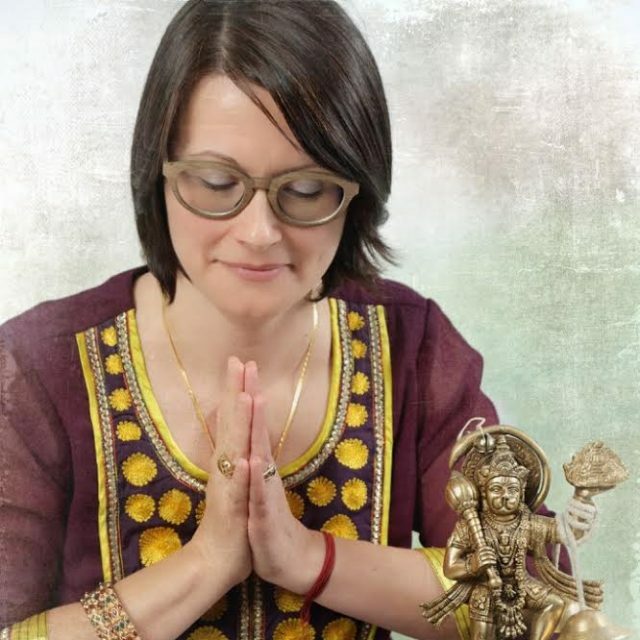 Rina Arcanā is also a devoted Karma Yoga at Cave of the Heart and lover of Ganesh! A mother to her beautiful daughter Sarah, and fur mom to her beloved dog Caymus, you can find Arcanā at the Cave during Kirtan belting out “Om Gam Ganapataye Namaha!” with all her heart! 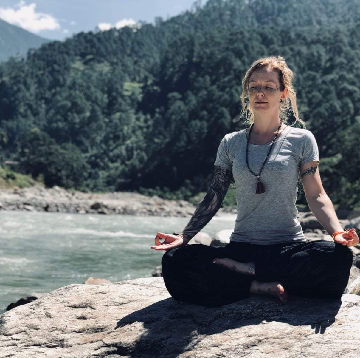 After fifteen years of practicing various styles of yoga and learning from many gifted and caring instructors, a longing for a deeper spiritual practice led Jenny Shakti Alderdice to India, deep in the Himalayas. It was there where she studied the teachings of Swami Sivananda and Swami Vishnudevananda at the Kutir Ashram. On the river banks of the great Maa Ganga she practiced daily meditation, studied Vedanta, and learned how to teach yoga. She has recently returned from India and is eager to share with the world the peace, love, and joy that has permeated her heart. She is certified to teach Sivananda yoga and outside of the studio she is employed as a nurse practitioner, striving to incorporate Eastern philosophies with Western medicine for a more holistic approach to not just health, but wellness! 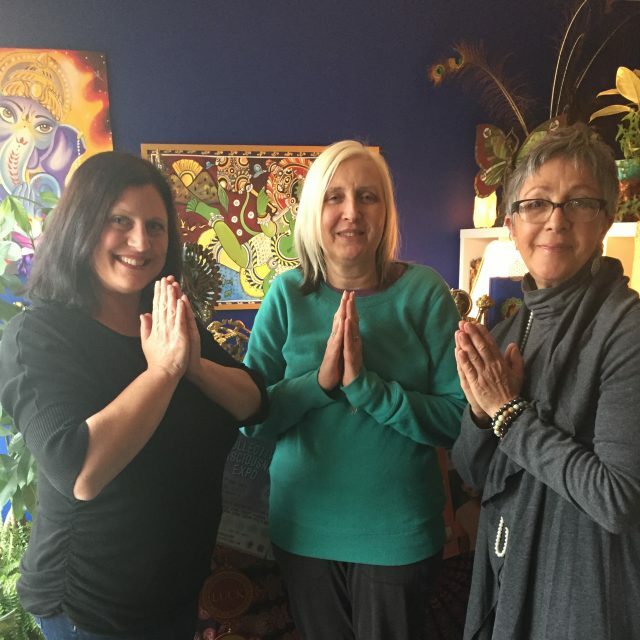 Meet our Beloved Karma Yogis from Cave of the Heart! These Beautiful Devis help us immensely with the care of our Holistic Centre and Yoga Studio. Out of the pure kindness of their hearts, these Lovely Ladies serve our space to assist in maintaining positive vibrations. They also help with baking Prasad (blessed Vegan sweets served after Satsang & Kirtan) and hand-crafting Spiritual Jewelry for our Front Reception area. Boundless Gratitude to our Karma Yogis: Rina Arcanā Antinucci, Janice Beemer, Christina Bombardier, Hannah Bound, Christine Coral, Nancy Daya Drew, Christine Hamel-Fuerth, Barbara Jean Lam, and Anna Tomaselli. Namaste’ Sweet Sisters! Meet The Kirtaneers, our in-house Bhakti Band consisting of Cassidy Sita Logsdon (Violin), David Pare (Drum), Josie Burns (Tambourine) Nancy Daya Drew (Harmonium/Lead Vocals) and Kerrie Prema Riberdy (Kartals). These Beautiful Bhaktis help ignite the spark in your heart through devotional chanting and live musical instruments. This is called Kirtan, a form of Bhakti Yoga (Path of Love and Devotion). By chanting the many names of the Divine, we unite our true Self with a Higher Power, God. It is said that when people come together and chant, their hearts beat as one. No experience is required, just come with an open heart! Kirtan is held the last Sunday of each month from 7-9pm and is by donation. This is done in the service of Seva, to help all beings (animal, plant and human) in need. OM NAMO NARAYANAYA!